Bring the needle through the fabric on the stitch line, then take a small backward stitch through the fabric. Bringt he need through again, a little in front of the first stitch, take another stithc, inserting the needle at the point where it first came through. Bring the thread up in the desired position, hold the thread down with the left thumb and encircle the thread twice with the needle. Still holding the thread firmly, twist the needle back to the starting point and insert it close to where the thread first emerged. Pull thread through to the back and secure for a single French knot or pass on to the position of the next stitch. This stitch is made up of straight stitches worked closely together across the shape. Care must be taken that the stitches are neither too long nor too tight as this will pucker the fabric. Bring the thread up in the desired position. Make a small loop with the thread and insert the needle beside where it first emerged. Fasten each loop at the end with a small stitch. This stitch may be worked singly or in groups to form flower petals. To start, bring the thread out on the lower line (A), insert the needle in position in the upper line (B), taking a straight downward stitch with the thread under the needle. The stitches are alternately long and short in the designated space. A fill-in stitch for paws, leaves, etc. 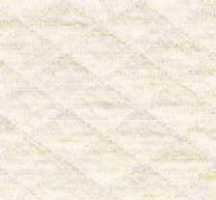 This natural cotton muslin has a quilted look with a 1/2" diamond stitched pattern. Fabric must be pre-washed before stitching. Easy and quick to dye or tea-dye. Stitching looks great on this fabric and you don't need much. It's 60" wide.